XML is a standardized markup language that defines a set of rules for encoding hierarchically structured documents in a human-readable text-based format. XML is in widespread use, with documents ranging from very short and simple (such as SOAP queries) to multi-gigabyte documents (OpenStreetMap) with complicated data relationships (COLLADA). In order to process XML documents, users typically need a special library: an XML parser, which converts the document from text to internal representation. XML is a compromise between parsing performance, human readability and parsing-code complexity–therefore a fast XML parser can make the choice of XML as an underlying format for application data model more preferable. This chapter describes various performance tricks that allowed the author to write a very high-performing parser in C++: pugixml. While the techniques were used for an XML parser, most of them can be applied to parsers of other formats or even unrelated software (e.g., memory management algorithms are widely applicable beyond parsers). Since there are several substantially different approaches to XML parsing, and the parser has to do additional processing that even people familiar with XML do not know about, it is important to outline the entire task at hand first, before diving into implementation details. With SAX (Simple API for XML) parsers, the user provides the parser with a document stream as an input and several callbacks such as “start of tag,” “end of tag,” “character data inside tag”. The parser invokes the callbacks according to the data in the document. The context needed for parsing is limited by the tree depth of the current element, which means that the memory requirements are greatly reduced. This type of parsing can be used for streaming documents where only part of the document is available at any single time. Pull parsing is similar to SAX in the parsing process–that is, the document is processed one element at a time–but the control is inverted: in SAX, parsing is controlled by the parser through callbacks, whereas in Pull parsing the user controls the parsing process through an iterator-like object. With DOM (Document Object Model) parsers, the user provides the parser with the entire document as a text stream/buffer, from which the parser generates a document object–an in-memory representation of the entire document tree, which has an individual object for each specific XML element or attribute, and a set of allowed operations (e.g., “get all child elements of this node”). Pugixml follows this model. Pugixml focuses on the problem of DOM parsing largely because, while fast and lightweight SAX parsers (such as Expat) were available, all production-ready XML DOM parsers at the time of pugixml’s creation (2006) were either not very lightweight, not very fast or–usually–neither. Thus the main goal of pugixml is to be a very fast lightweight DOM-based XML manipulation library. XML is defined by a W3C recommendation that specifies two different types of parsing: validating and non-validating (in other words, non-validating parsers check XML syntax while validating parsers can check data semantics as well). Even a non-validating parser has to do some relatively resource-intensive validation work. When performance is the primary goal, a compromise must be reached between performance and conformance. For pugixml the compromise is as follows: any well-formed XML document will be fully parsed, including all required transformations, with the exception of document type declarations.1 Since only rules that are fast to verify are checked, a non-well-formed document can sometimes be parsed successfully. The data in an XML document often has to be transformed in certain ways by the time it reaches the user. The transformations include end-of-line handling, attribute-value normalization and character reference expansion. These transformations have an associated performance cost; pugixml optimizes them as much as possible while providing a way to disable them for maximum performance. The task at hand is to make a fast DOM parser that successfully parses conforming XML documents with required transformations, is as fast as reasonably possible, and is production ready. For performance purposes, “production ready” mainly means it offers resistance to malformed data. Sacrificing buffer overrun checks to improve performance is not feasible. Next, we’ll discuss the parsing process used by pugixml. The last sections will describe the data structure used by pugixml to store the document object model and the algorithm used by pugixml to allocate memory for this data structure. The goal of a DOM parser is to take an input–a string that contains an XML document–and produce a tree of objects that represents the same document in memory. A parser typically consists of two stages: a lexer and a parser. A lexer is given an input character stream and produces a token stream. (For an XML parser the set of tokens can include open angle brackets, quotation marks, tag names, and attribute names.) The parser consumes the token stream and produces a syntax tree based on the grammar, using one of many parsing algorithms such as recursive descent. When encountering a token with string data, such as a tag name, the lexer or parser copies the string contents to a heap and stores a reference to the string inside a tree node. To improve parsing performance, pugixml deviates from the typical approach in several ways. As mentioned before, parsers traditionally use lexers to convert the character stream into a token stream. This can improve performance in cases where a parser has to do a lot of backtracking, but for XML parsers a lexer stage is just an extra layer of complexity that increases the per-character overhead. Thus pugixml operates on a character stream instead of a token stream. There are several inefficiencies in the typical implementation of a parser. One of them is copying string data to the heap. This involves allocating many blocks of varying sizes, from bytes to megabytes, and requires us to copy all strings from the original stream to the heap. Avoiding the copy operation allows us to eliminate both sources of overhead. Using a technique known as in-place (or in situ) parsing, the parser can use data from the stream directly. This is the parsing strategy used by pugixml. As such, this is a tradeoff between performance and memory usage. In-place parsing is usually faster compared to parsing with copying strings to the heap, but it can consume more memory. An in-place parser needs to hold the original stream in memory in addition to its own data describing the document’s structure. A non in-place parser can store relevant parts of the original stream instead. Character reference expansion: XML supports escaping characters using their Unicode code point with either decimal or hexadecimal representation. For example, &#97; should expand to a and &#xf8; should expand to ø. Entity reference expansion: XML supports generic entity references, where &name; is replaced with the value of entity name. There are five predefined entities: &lt; (<), &gt; (>), &quot; (“), &apos; (‘) and &amp; (&). Attribute-value normalization: in addition to expanding references, the parser should perform whitespace normalization when parsing attribute values. All whitespace characters (space, tab, carriage return and line feed) should be replaced with a space. Additionally, depending on the type of the attribute, leading and trailing whitespaces should be removed and whitespace sequences in the middle of the string should be collapsed into a single space. Interestingly, in-place parsing can be used with memory-mapped file I/O6. Supporting null-termination and text transformation requires a special memory mapping mode known as copy-on-write to avoid modifying the file on disk. The kernel can usually map cache pages directly into the process address space, thus eliminating a memory copy that would have happened with standard file I/O. If the file is not already in the cache, the kernel can prefetch sections of the file from disk, effectively making I/O and parsing parallel. Since only modified pages need to allocate physical memory, memory consumption can be greatly decreased on documents with large text sections. Eliminating string copies is not the only thing we can do to optimize parser performance. When comparing parser performance, a useful metric is the average number of processor cycles spent for each character. While this varies among documents and processor architectures, it is reasonably stable for documents of similar structure. Thus it makes sense to optimize for this metric, and an obvious place to start is in the operations performed for each character. The most important operation is detecting character set membership: given a character from the input stream, does it belong to a certain set of characters? For encodings where each character occupies no more than 8 bits, a table of size 256 is sufficient. For UTF-8, we would like to use a byte-indexed table to avoid code point decoding; this works only if all characters with code points (i.e. numeric values) above 127 belong to the set or no characters with code points above 127 belong to the set. If either of these are true, then a table of size 256 is sufficient. The first 128 entries of the table are filled with true or false (depending on whether the character is in the target set) and the last 128 entries of the table all share the same value. Because of the way UTF-8 encodes data, all code points above 127 will be represented as sequences of bytes with values above 127. Furthermore, the first character of the sequence will also be above 127. For UTF-16 or UTF-32, tables of large sizes are usually impractical. Given the same constraint as the one for optimized UTF-8, we can leave the table to be 128 or 256 entries large, and add an additional comparison to deal with values outside the range. ct_parse_attr    = 2, // \0, &, \\r, ', "
If we work character by character, improving on the above approaches is usually impossible. However, it is sometimes possible to work on groups of characters and use vectorized checks. If the target system has some form of SIMD instructions available, you can usually use these instructions for fast operation on groups of 16 characters or more. The PCDATA parsing function takes a pointer to the start of PCDATA value, and proceeds by reading the rest of the value, converting the value data in-place and null-terminating the result. Since there are two boolean flags, we have four variations of this function. In order to avoid expensive run-time checks, we’re using boolean template arguments for these flags–thus we’re compiling four variations of a function from a single template, and then using runtime dispatch to obtain the correct function pointer once before the parsing begins. The parser calls the function using this function pointer. An additional function gets a pointer to a suitable implementation based on runtime flags; e.g., &strconv_pcdata_impl<false, true>::parse. One unusual item in this code is the gap class instance. As shown before, if we do string transformations, the resulting string becomes shorter because some of the characters have to be removed. There are several ways of doing this. One strategy (that pugixml doesn’t use) is to keep separate read and write pointers that both point to the same buffer. In this case the read pointer tracks the current read position, and the write pointer tracks the current write position. At all times the invariant write <= read should hold. Any character that has to be a part of the resulting string must be explicitly written to the write pointer. This technique avoids the quadratic cost of naive character removal, but is still inefficient, since we now read and write all characters in the string every time, even if we don’t need to modify the string. An obvious extension of this idea is to skip the prefix of the original string that does not need to be modified and only start writing characters after that prefix–indeed, that’s how algorithms like the one behind std::remove_if() commonly operate. Figure 4.3 - An example of gap operations during PCDATA conversion. The pugixml parser itself can be thought of as a recursive-descent parser. However, the recursion is transformed into a loop to improve performance. A node cursor acts as a stack. When a start tag is encountered, a new node is appended to the cursor and becomes the new cursor; when an end tag is encountered, the cursor is moved to the parent of the current cursor. This makes stack space consumption constant regardless of the input document, which improves robustness, and avoids potentially expensive function calls. The parser uses a dispatch loop that reads a character from the stream, reads zero or more characters past that (depending on the first character) to determine the tag type, and then proceeds to the code that parses the relevant tag. For example, if the first character is <, we have to read at least one more character to differentiate between a start tag, end tag, comment, or other types of tags. Pugixml also uses goto statements to avoid going through the dispatch loop in certain cases – for example, text content parsing stops at the end of stream or the < character. However, if the next character is <, we don’t have to go through the dispatch loop only to read the character again and check that it’s <; we can jump straight to the code that does the tag parsing. Two important optimizations for such code are branch ordering and code locality. In the parser, various parts of the code handle various forms of inputs. Some of them (/such as tag name or attribute parsing) execute frequently, while others (/such as DOCTYPE parsing) rarely execute at all. Even within a small section of code, different inputs have different probabilities. For example, after the parser encounters an open angle bracket (<), the most likely character to appear next is a character of a tag name. Next most likely is /10, followed by ! and ?. With this in mind, it is possible to rearrange the code to yield faster execution. First, all “cold” code; that is, code that is unlikely to ever execute, or is unlikely to execute frequently–in the case of pugixml this includes all XML content except element tags with attributes and text content – has to be moved out of the parser loop into separate functions. Depending on the function’s contents and the compiler, adding attributes such as noinline, or specifically marking extra functions as “cold” might help. The idea is to limit the amount of code inlined into the main parser function to the hot code. This helps the compiler optimize the function by keeping the control flow graphs small, and keeps all hot code as close together as possible to minimize instruction cache misses. In this version the branches are sorted by probability from most-frequent to least-frequent. This minimizes the average amount of condition tests and conditional jumps performed. Memory safety is an important concern for a parser. On any input (including malformed input), the parser must never read or write memory beyond the end of the input buffer. There are two ways to implement this. The first option is to make sure the parser checks the current read position against the end position everywhere. The second option is to use a null-terminated string as an input and make sure the parser handles the null terminator accordingly. Pugixml uses an extended variant of the latter. skips a run of alphabetical characters and stops at the null terminator or the next non-alphabetic character without requiring extra checks. Storing the buffer end position everywhere also reduces the overall speed because it usually requires an extra register. Function calls also get more expensive since you need to pass two pointers (current position and end position) instead of one. However, requiring null-terminated input is less convenient for library users: often XML data gets read into a buffer that might not have space for an extra null terminator. From the client’s point of view a memory buffer should be a pointer and a size with no null terminator. This summarizes the most interesting tricks and design decisions that help keep pugixml parser fast for a wide range of documents. However, there is one last performance-sensitive component of the parser that is worth discussing. An XML document is a tree-like structure. It contains one or more nodes; each node can contain one or more nodes; nodes can represent different types of XML data, such as elements or text; and element nodes can also contain one or more attributes. Pugixml chooses to represent both node and attribute collections as a linked list. Why not as arrays? The two main benefits of arrays are fast index-based access (which is not particularly important for pugixml) and memory locality (which can be achieved through different means). 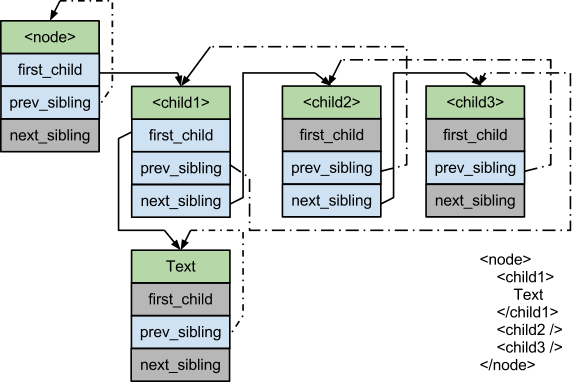 Fast index-based access is usually not needed because the code that processes the XML tree either needs to iterate through all child nodes or get a specific node that is identified by the value of an attribute (e.g. “get the child node with an ‘id’ attribute equal to ‘X’”).14 Index-based access is also fragile in a mutable XML document: for example, adding XML comments alters the indices of subsequent nodes in the same subtree. Here, the last_child pointer is necessary to support backwards iteration and appending in O(1) time. Note that with this design it is easy to support different node types to reduce memory consumption; for example, an element node needs an attribute list but a text node does not. The array approach forces us to keep the size of all node types the same, which prevents such optimization from being effective. Pugixml uses a linked list-based approach. That way, node modification is always O(1). Furthermore, the array approach would force us to allocate blocks of varying sizes, ranging from tens of bytes to megabytes in case of a single node with a lot of children; whereas in the linked list approach there are only a few different allocation sizes needed for node structure. Designing a fast allocator for fixed size allocations is usually easier than designing a fast allocator for arbitrary allocations which is another reason pugixml chooses this strategy. first_child points to the first child of the node, or NULL if node has no children. prev_sibling_cyclic points to the left sibling of the node (a child of node’s parent that is immediately before the node in the document). If the node is the leftmost one (i.e., if the node is the first child of its parent), prev_sibling_cyclic points to the last child of the node’s parent, or to itself if it is the only child. prev_sibling_cyclic cannot be NULL. next_sibling points to the right sibling of the node or NULL if the node is the last child of its parent. The array-based approach and the linked list approach with the partially-cyclic-sibling-list trick become equivalent in terms of memory consumption. Using 32-bit types for size/capacity makes the array-based node smaller on 64-bit systems.16 In the case of pugixml, other benefits of linked lists outweigh the costs. With the data structures in place, it is time to talk about the last piece of the puzzle–the memory allocation algorithm. A fast memory allocator is critical for the performance of a DOM parser. In-place parsing eliminates allocation for string data, but DOM nodes still need to be allocated. String allocations of varying sizes are also needed to support tree mutation. Preserving allocation locality is important for tree traversal performance: if successive allocation requests return adjacent memory blocks, it becomes easy to ensure tree locality during construction. Finally, destruction speed is important: in addition to deletion in constant time, the ability to quickly deallocate all memory allocated for the document without deleting each node individually can significantly improve the time it takes to destroy large documents. Before discussing the allocation scheme that pugixml uses, let’s discuss a scheme that it could have used. Since DOM nodes have a small set of required allocation sizes, it would be possible to use a standard memory pool based on free lists for each size. For such a pool, there would be a single linked list of free blocks where each block is the same size. During an allocation request, if the free list is empty, a new page with an array of blocks is allocated. The blocks are linked together to form a single linked list, which then becomes the free list of the allocator. If a free list is not empty, the first block is removed from the list and returned to the user. A deallocation request simply prepends the block to the free list. This allocation scheme is very good at reusing memory–allocating a node after freeing some other node would reuse the memory immediately. However, adding support for releasing memory pages back to the heap requires additional per-page tracking of used blocks. The locality of the allocations also varies on the prior usage of the allocator, which may end up decreasing traversal performance. Since pugixml supports tree mutation, it requires support for allocations of arbitrary size. It was unclear whether this allocator could be easily extended to support arbitrarily sized allocations and other required features of pugixml without impacting the parsing performance. Employing a complicated general-purpose allocation scheme akin to the algorithms implemented in dlmalloc and other general-purpose memory allocators was also not an option–such allocators tend to be somewhat slower than simple free lists, not to mention more complex. Pugixml needed something simple and fast. It turns out that the simplest allocation scheme possible is the stack allocator. This allocator works as follows: given a memory buffer and an offset inside that buffer, an allocation only requires increasing that offset by the allocation size. Of course, it is impossible to predict the memory buffer size in advance, so an allocator has to be able to allocate new buffers on demand. size_t extra_size = (size > allocator_page_size) ? This allocator is very fast. It’s probably the fastest allocator possible, given the constraints. Benchmarks show it to be faster than a free list allocator, which has to do more work to determine the correct list based on page size and has to link all blocks in a page together. Our allocator also exhibits almost perfect memory locality. The only case where successive allocations are not adjacent is when it allocates a new page. In case of small allocations this allocator does not waste memory. However, it is possible to devise a hypothetical memory allocation pattern (that might arise in practice) where it does waste memory. A sequence of allocation sizes alternating between 64 and 65536 would cause a new page allocation on every call, resulting in 30% wasted space. For this reason, the implementation of this allocator in pugixml behaves slightly differently: if an allocation is larger than a quarter of the default page size, it allocates an entire page for it, and instead of adding it to the front of the page list, it adds it after the first entry. That way, the small allocations that happen after a large one still go into the page in progress. Note that allocate_oob() is “cold” code–that is, it only gets executed once we exhaust the current page, which should be a rare event. For this reason, explicitly forbidding the compiler to inline it can improve performance.18 This also means that having more complicated logic in allocate_oob()–for example, logic that treats large allocations differently–does not have any effect on the overall performance of the allocator. Finally, since all allocations are contained in some page and the allocator keeps the entire page list as a state, it’s very easy to destroy the entire page list and thereby free all allocated memory. This is very fast since it only touches headers of each page in memory. The implementation discussed in the previous section does not have any way to release or reuse memory. Interestingly, for a lot of use cases this is actually not a big deal. Since we can release the memory on document destruction by removing all pages19, parsing a document or creating a new document does not consume extra memory. However, a problem arises when we delete a substantial portion of the document and then proceed to add more nodes to the document. Since we never reuse memory, peak memory consumption can become very significant. Implementing fine-grained reuse while preserving the allocation performance seems impossible. However, a compromise can be reached. During allocation, we’ll count the number of allocations made in each respective page. Deallocation requests then have to get a reference to the page of the destroyed pointer and decrease this counter. If this counter reaches zero, the page is not needed any more and can be removed. For this to be possible, we need to know what page each object was allocated in. This is possible without storing a pointer to the page, but it is difficult.20 For this reason, pugixml resorts to storing a page pointer alongside each allocation. Pugixml uses two different approaches to reducing the memory overhead associated with storing a page pointer with each allocation. The first approach is to store a page pointer in a single pointer-sized field with several bits of unrelated data which we would have to store anyway. The allocator makes sure that all pages are aligned to 32 bytes, so this means that the five least significant bits of every page pointer are zero; as such they can be used to store arbitrary data. Five bits is a good number because the metadata of an XML node fits: three bits are used for a node type, and two bits are used to specify whether the node’s name and value reside in the in-place buffer. If our page size is limited by 216 = 65536 bytes, this offset fits in 16 bits, so we can spend 2 bytes instead of 4 storing it. Pugixml uses this approach for heap-allocated strings. An interesting feature of the resulting algorithm is that it respects the locality of reference exhibited by the code that uses the allocator. Locality of allocation requests eventually leads to locality of allocated data in space. Locality of deallocation requests in space leads to successfully released memory. This means, in the case of tree storage, that deletion of a large subtree usually releases most of the memory that is used by the subtree. Of course, for certain usage patterns nothing is ever deleted until the entire document is destroyed. For example, if a page size is 32000 bytes, we can do one million 32-byte allocations, thus allocating 1000 pages. If we keep every 1000th object alive and delete the remaining objects, each page will have exactly one object left, which means that, although the cumulative size of live objects is now 1000 ⋅ 32 = 32000 bytes, we still keep all pages in memory (consuming 32 million bytes). This results in an extremely high memory overhead. However, such usage is extremely unlikely, and the benefits of the algorithm outweigh this problem for pugixml. Optimizing software is hard. In order to be successful, optimization efforts almost always involve a combination of low-level micro-optimizations, high-level performance-oriented design decisions, careful algorithm selection and tuning, balancing among memory, performance, implementation complexity, and more. Pugixml is an example of a library that needs all of these approaches to deliver a very fast production-ready XML parser–even though compromises had to be made to achieve this. A lot of the implementation details can be adapted to different projects and tasks, be it another parsing library or something else entirely. The author hopes that the presented tricks were entertaining and that some of them will be useful for other projects.